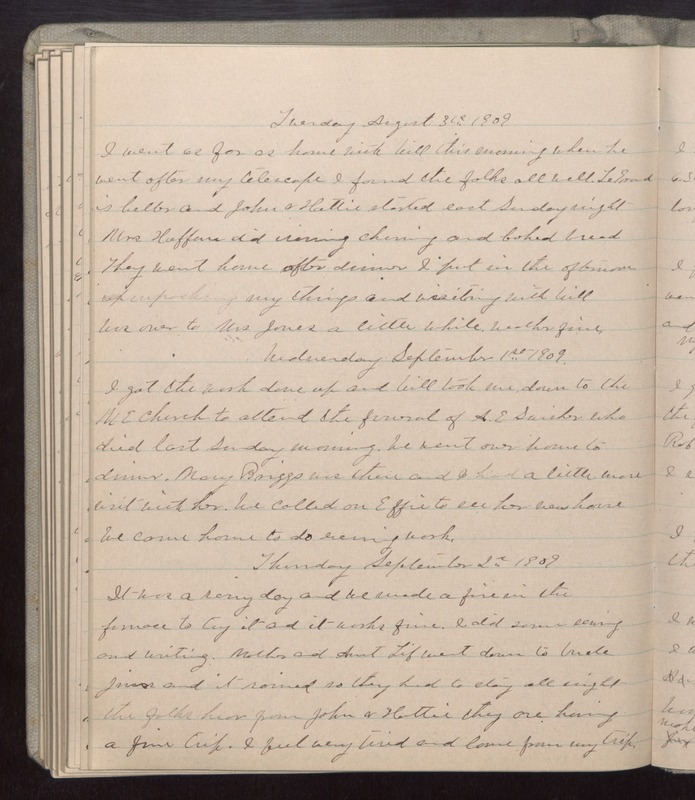 Tuesday August 31st 1909 I went as far as home with Will this morning when he went after my telescope I found the folks all well. Le[Grand?] is better and John & Hattie started east Sunday night Mrs Hoffman did ironing churning and baked bread They went home after dinner I put in the afternoon unpacking my things and visiting with Will was over to Mrs Jones a little while. Weather fine. Wednesday September 1st 1909 I got the work done up and Will took me, down to the M E church to attend the funeral of A. E [Saisher?] who died last Sunday morning. We went over home to dinner. Mary Briggs was there and I had a little more visit with her. We called on Effie to see her new house we came home to do evening work. Thursday September 2nd 1909 It was a rainy day and we made a fire in the furnace to try it and it works fine. I did some sewing and writing. Mother and Aunt Lif went down to Uncle [Jim?] and it rained so they had to stay all night the folks hear from John & Hattie they are having a fine trip. I feel very tired and lame from my trip.